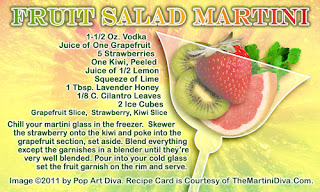 FRUIT SALAD MARTINI - Who Needs a Plate? 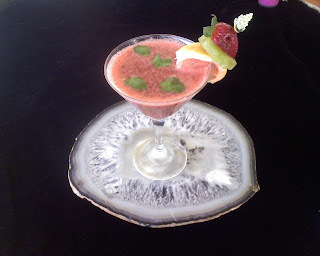 Would you believe that all the ingredients in this martini were originally destined for a plated salad? After hitting the local Farmer's Market I came home with fresh strawberries, pink grapefruit, a couple of kiwis and a nice bunch of cilantro. I wanted to do a fruit salad using some of my ingredients so I googled up a few recipes online and found one that used all my fresh finds! I replaced the vinegar from the recipe with some lemon and lime juice for the acid and substituted lavender honey for the oil part of the salad dressing to add a little sweetness, then tossed the whole kit and caboodle into my blender with a few ice cubes. Of, course I added booze to the recipe - in this case plain vodka. I didn't want any additional flavor from the alcohol to overwhelm the fresh produce. I may never eat fruit salad from a plate again.